The Metropolitan Symbol, one of the two official emblems of Tokyo. This article is about metropolitan Tokyo. For more information, see Tokyo (disambiguation). Tokyo Metropolis (東京都, Tōkyō-to) is the official name for of the traditional city of Tokyo (東京市, Tōkyō-shi) (1869-1943) and the associated municipalities of what was formerly Tokyo Prefecture (東京府, Tōkyō-fu) (1869-1943). It is the capital city and a prefecture of Japan on the island of Honshu. 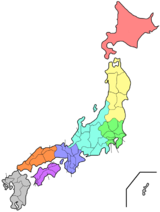 Greater Tokyo includes land in the Kantō region and also the Izu Islands and Ogasawara Islands. Ten percent (10%) of the Japanese people live in Tokyo, and as many as twenty percent (20%) of the population live around it. As of 2007, the population was 12,790,000. Tokyo is in a part of Japan called the Kantō Plain. Two big rivers run through Tokyo. One is the Arakawa River which runs from the north to the south, and flows into Tokyo Bay. The other is the Tama River which runs from the west to the east. The Tama River is a border between Tokyo and its neighbor city, Kawasaki. In 1943, Tokyo prefecture's municipalities and city of Tokyo were associated in a special way. The administration of Tokyo city merged with the administration of Tokyo Prefecture. Tokyo Metropolis is governed by the Tokyo Metropolitan Government. Tokyo has many outlying islands. The Izu Islands include Izu Ōshima, Toshima, Niijima, Shikinejima, Kozushima, Miyakejima, Mikurajima, Hachijojima, and Aogashima. The Ogasawara Islands include Chichi-jima, Nishinoshima, Haha-jima, Kita Iwo Jima, Iwo Jima, and Minami Iwo Jima. Minami Torishima, the easternmost point in Japan, is also part of the Ogasawaras. Okinotorishima, the southernmost point in Japan, is also administered by Tokyo as part of this group. Two commercial airports serve Tokyo. Haneda Airport is in the city limits next to Tokyo Bay. This airport is mostly for domestic travel. Most international flights to and from Tokyo go through Narita International Airport in Chiba Prefecture, opened in 1978. ↑ 2.0 2.1 Tokyo Metropolitan Government, 東京都年表 (Japanese); retrieved 2013-4-13. ↑ Nussbaum, Louis-Frédéric. (2005). "Tōkyō" in Japan Encyclopedia, pp. 981-982; "Kantō" atp. 479. ↑ The idea of removing one level of government and raising Tokyo City administration to the level of other prefectures was not new. It had talked about since the 19th century -- for example, see draft of Tokyo law which was not passed in 1895. ↑ McCormack, Gavan. "Dilemmas of Development on The Ogasawara Islands," JPRI Occasional Paper, No. 15 (August 1999). Japan Policy Research Institute (University of San Francisco); retrieved 2013-2-27. ↑ "Japan hopes to build lighthouse on atoll disputed with China," Xinhua (China). August 5, 2005; retrieved 2013-2-27. This page was last changed on 1 January 2017, at 13:40.